Botel Maastricht is a pleasant ship with simple cabins, a convenient lounge, bar and in the summer a terrace. 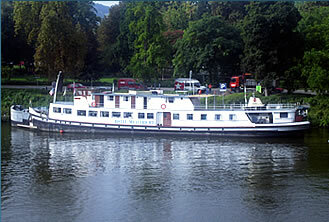 Botel Maastricht is situated on the river Maas next to the Maasboulevard in the heart of the city centre of Maastricht. The many cosy restaurants, bars, shops and historical buildings are within walking distance. Botel Maastricht doesn’t dispose of private parking facilities. For safe garaging we recommend one of the underground parking garages in Maastricht. The nearest parking garage is located at the Onze Lieve Vrouwe Square, a two-minute walk from Botel Maastricht. However, the possibility exists to park in front of Botel Maastricht to unload your luggage. Breakfast includes orange juice, coffee or tea, slices of brown and white bread, a bread roll, ham, cheese, all sorts of sweet sandwich spread and a boiled egg. Breakfast is served from 08.00 until 10.30. On request we can serve breakfast earlier. If indicated in plenty of time, we can also provide packed lunches.